POSTCARD #135: Glasgow, Scotland: Battles lost and won and always the bagpipes have a part to play. There’s an extraordinary power about the instrument. I hear it as I’m walking down Buchanan Street, drawn towards the sound, and see the huge crowd surrounding the group outside an expensive shopping mall. 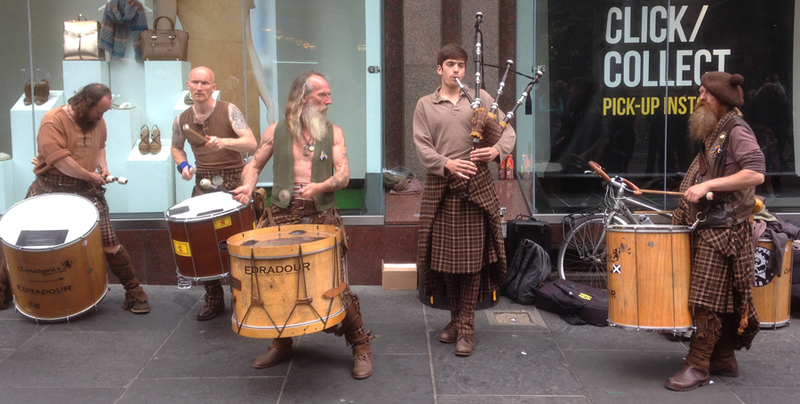 Street musicians, I don’t know anything about the tartan kilt outfits they wear – the piper seems kinda clean-cut to me, respectable. Maybe he’s also a part-time piper in other bands, or one of the sons of these war-like characters beating out a furious rhythm on the drums. Somebody else going around collecting coins in an open box – there must be more than a hundred pounds in there ($150). I pour the contents of my pocket into the collection. Jiab was here a long time ago while I was in Japan, she stopped to listen to a street musician playing the pipes and the piper happened to be standing next to an old red phone box with glass panels smashed out (those were the days before cell phones). So Jiab had a think about time zones between here and Japan, gathered all the change she had and called me up. I was in the office in Yokohama and somebody said there was a call for me. Picked up the phone and there was this skirl and blare of the pipes coming from the other side of the world. Then Thai laughter and the sound of coins being shoved into the phone slot – we couldn’t talk or anything, the sound was so loud. So after a while we ended the call. Jiab has a sense of humor. Sound of the pipes fading into the background as I walk now through these streets back to my hotel… extraordinary that I have no home in Glasgow. I’m a tourist, even though I lived here for 5 years, and all that’s left is a strange familiarity – recognizing the streets, the buildings. Feels like I’m a member of a clan, vanquished, as if in a battle that took place in the time I was away – the Celtic sense of calamity. And today, after more than thirty years living in other people’s countries I discover I’m homeless. It feels like I don’t exist. I’m nobody, in a place where I used to be ‘somebody’. Mutuality in the illusion; clan, this is all we seem to have in the lifetime we share. In truth, it all merges into one; cycles of darkness and light, and seasons, a spinning planet around the sun, cycles of organic forms that reproduce, die and other’s take their place, continuously. Note: Dear friends tomorrow I’m going offline for a couple of weeks in order to enter a retreat and receive advice on my health situation. I’ll be back again in July and catch up with your posts and comments then. Thanks for reading…. Our home is bigger than we remember. So is our family. Individuality within perfection.. solitude within all… whichever way you look, it adds up to beauty. Be well. Thanks for sharing your profound reflections. I send you best wishes for your health. A sense of homelessness comes with living away from our clan roots… Being nobody may be the most profound shift there can be. May this time away nourish, heal and refresh T.
Good luck on your retreat and dealing with your health problems. You will be missed. “See ya” in July. On the opposite end of the spectrum, I’ve lived in this house, this town, for thirty years, and the house and town of my parents and my upbringing twenty years prior. In my deepest moments of armchair zen it becomes quite clear just how individual and virtually isolated each being is, humans included, of course. Yet alongside is the thought that even in this sense we are united, and ultimately all a part of the same universe. A kinship to the very atoms, electrons and photons that are the makeup of everything. Glad to hear it! Hope you’re rejuvenated; you can’t beat the Scottish air…. So best to minimise personal attachment perhaps and so minimise the pain.